Cable clutter is majorly irritating, but even more so when it’s in a heavily used area like the kitchen. Designer Mike Charles set out to invent an iPhone charger that would hide the cables but also look like it belongs in a kitchen. Thus the Foaster (phone + toaster) was born. 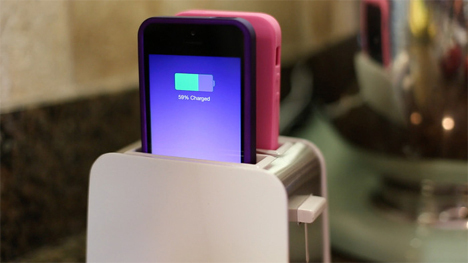 The Foaster allows you to charge with just one hand: drop your phone into one of the dual slots and it’s instantly connected to the internal Lightning cables and USB cables. The Foaster is pretty stylish and comes in a number of finishes, so it will fit right in with the rest of your kitchen decor. Unfortunately, it doesn’t let you push down on the sliding button to lower your iPhone and it doesn’t pop up when it’s done charging. However, it does let you see any alerts that come in on your screen, which is handy when you want to glance over and see who just texted you without picking up your phone. Mike Charles took his idea to Kickstarter to get the product’s all-American production underway. 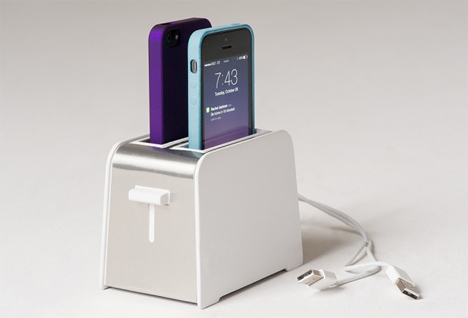 A pledge of $79 gets you an advance version of the super-slick charger.